Original manuscripts should be clear, precise and logical and should not normally exceed 4,000 words.  Covering letter - the letter must contain: why the submission is appropriate for publication in Annali di Igiene; what is known about the topic discussed; what your study adds; and confirmation that the paper has not been published - or submitted for publication - elsewhere. b) the name(s) and the affiliation(s) of the Author(s). Please clearly indicate the given name(s) of each Author and check that all names are accurately spelled; add the main degrees of every Author (two only each), present the Author(s)'s affiliation addresses (where the actual work was done) below the names. Indicate all affiliations with a lower case superscript letter immediately after the Author(s) name(s) and in front of the appropriate address. Provide the full postal address of each affiliation, including the country name and the e-mail address of each Author. d) the name of the corresponding Author. Clearly indicate who will handle correspondence at all stages of refereeing and publication, also post-publication. Ensure that the e-mail address is given and that contact details are kept up to date by the corresponding Author.  Abstract. This should be structured under the following headings: Background, Study design, Methods, Results, Conclusions.  Abstract is to be prepared in both English and Italian. Non-Italian Authors are welcome to request that the Italian translation of title, key words and abstract are made editorially at no extra cost.  Key words. 3-6 key words should follow the abstract. 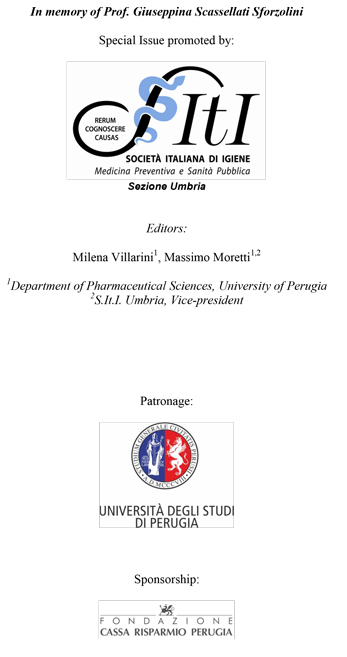 Please note that any costs for reproducing materials whose copyright is not held by the authors or by Annali di Igiene is to be met by the authors.  Tables and figures must have a title and should be kept to a minimum. Tables and figures must be comprehensible without reference to the text (self-explaining). References should not be cited in the tables. Authors should indicate at approximately what point in the text the table should appear. Figures, graphs, drawings etc. should not be overcomplex and must be intelligible when reduced in size for printing. They should be on separate file each, numbered and with legends. Number tables and figures consecutively in accordance with their appearance in the text. Place table's footnotes below the table body and indicate them with superscript lowercase letters. Avoid vertical rules.  Acknowledgements. Collate acknowledgements in a separate section at the end of the article before the references and do not, therefore, include them on the title page, as a footnote to the title or otherwise. Include, when appropriate: Statements of ethical approval, Funding and Competing Interests. List here also those individuals who provided help during the research (e.g., providing language help, writing assistance or proof reading of the article, etc.). Citation in text: Please ensure that every reference cited in the text is also present in the reference list (and vice versa). Unpublished results and personal communications are not recommended in the reference list, but may be mentioned in the text. If these references are included in the reference list they should follow the standard reference style of the journal and should include a substitution of the publication date with either 'Unpublished results' or 'Personal communication'. Citation of a reference as 'in press' implies that the item has been accepted for publication. Reference style. Text: References must be numbered (in brackets) in the text. The actual Authors can be referred to, but the reference number(s) must always be given. List: Number the references in the list in the order in which they appear in the text. The titles of Journals must be abbreviated according to the style used in PubMed. Bibliographical titles should adopt the Vancouver style (BMJ 1982;284:1766-70). Reference to a journal publication: 1. 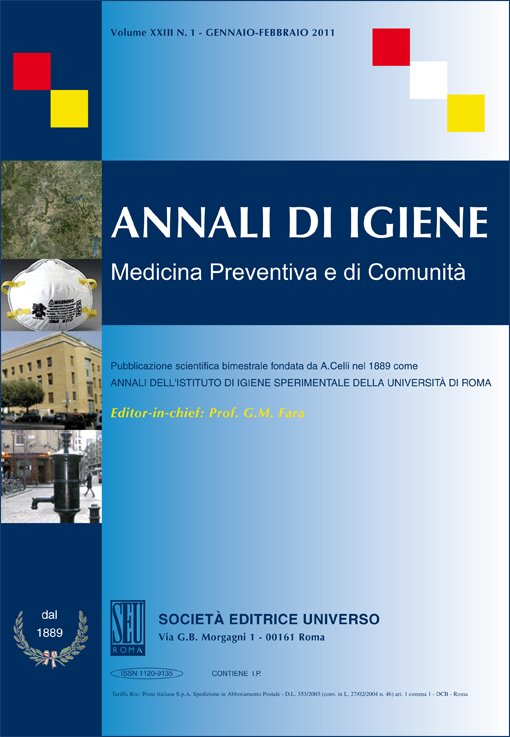 Protano C, Cattaruzza MS, Osborn JF, Vitali M. Indoor particulate matter and secondhand smoke: simulation of an exposure scenario. Ann Ig 2014; 26: 186-9. Reference to a book: 2. Strunk Jr W, White EB. The elements of style. 4th ed. New York: Longman, 2000. Reference to a chapter in an edited book: 3. Mettam GR, Adams LB. How to prepare an electronic version of your article. In: Jones BS, Smith RZ, Eds. Introduction to the electronic age. New York: E-Publishing Inc, 2009: 281-304.